How Much Does It Cost to Build a Shopping App Like Wish? In the today’s interconnected world we spend less and less of our time doing things offline - we stack the shelves of our smartphone’s memory instead. We have our taxi and food delivered via a few clicks - on demand apps like Postmates help, we no longer download music straight to our devices - why would we if there is Spotify now, and in recent years we have even given up on offline shopping - as now e-commerce marketplace app development has replaced it all. The idea of online marketplace like Wish or Flipkart is simple yet working - shop for anything out of anywhere within a few clicks on your device; no need to spend long hours in change rooms’ queues or waiting for a shop assistant to bring your size - creating a Wish-like app saves you from it all. Here we are going to discover important points that will help you develop a shopping app like Wish; also, we will try to calculate a rough cost to make shopping app like Wish. At this article we will look at how Wish works and the costs of an application like Wish is. Taking into account that 50% of all current smartphone users grab their device immediately after waking up [ExpressPigeon], e-commerce might very soon become the only shopping we go for. Though even on the current market the leader - Wish online marketplace is vividly seen. What is it that users WISH for? 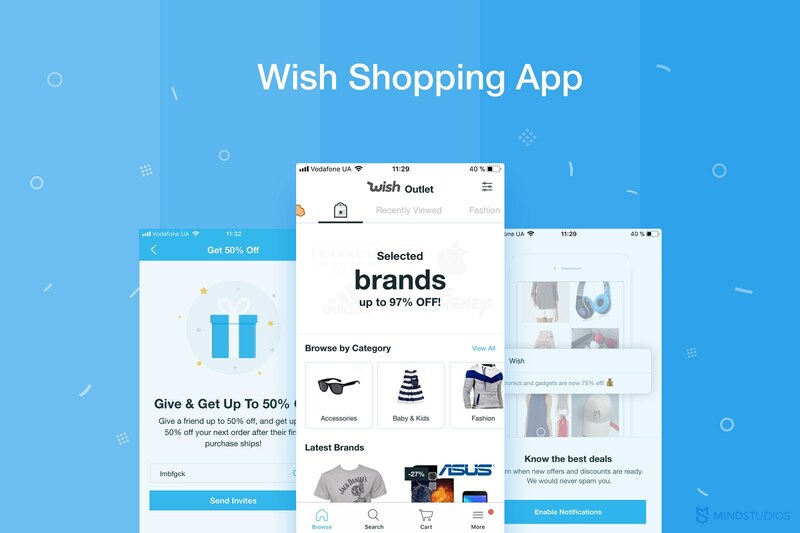 Founded by a former Google’s software engineer Peter Szulczewski in 2010, Wish has its eyes set on becoming the brightest shopping app in the world. Seems like it is a nice shot, as the recent data from Similar Web service suggests it is now the 2nd top-ranked app on the App Store. Moreover, Wish even seems to be capable of competing with retail giants like Ebay or Amazon - Statista shows it has the 5th position in the list of most popular mobile shopping apps in the United States. Perhaps this is why Wish startup has lately raised additional $ 500 million, and it’s overall market value now equals $ 3.5 billion roughly. The idea behind Peter’s product is simple yet efficient - it offers cut-price deals on anything from shoelaces to earphones & winter jackets, delivered directly from China. At the prices Wish sets for everybody shopping there really feels like bargain - lipsticks for $1, smart watches for $15 and laptops for $115 roughly speaking. The perfect target audience of this shopping are the so-called impulse purchasers or classic shopaholics - those who can be triggered with the good-looking pictures and costing next to nothing knick-knacks. All of these has been done in order to split Wish target audience, which was quite broad in the beginning. Co-founders targeted mostly youngsters, both male and female, who would not imagine their life - and their shopping respectively without a smartphone in their hands. Wish makes a living on the e-commerce market by taking 15% of the price of every purchase you make. This monetization scheme is different to Amazons or Alibaba’s as they charge 15% on top of purchaсe’s cost. Despite the high commission, there are a few things that users like about Wish app. Recognizing these points will help you better understand how to build an app like Wish Local or Cute from Wish. Wish shopping online is designed in a simple and intuitive way, though the number of features is quite heavy (we are going to look at them a bit later), it is presented in an easy-to-percept way. Once you get to download and open the WIsh application, it immediately asks you to select a few areas of interest (e.g. devices, clothes, decor), so that it could later delight you with products you love. It is not the only thing you get to select - for the best results users also need to enter their age, gender and shopping likes. I had tested it myself, and was surprised with how broad the finite results Wish returned me were - although only gadgets and decor categories were picked, it somehow has masks, sweaters and jewelry in the final selection. It seemed that Wish has only briefly examined the information about me as a user, and kept on selling goods with a cut-rate prices. Wish app could have some deeper analytical algorithms to pitch buyers things they really have a thing for - like the ones Badoo/Tinder use for their match-making schemes. If you are looking to create an application to beat Wish app - then it might be a great way for developers to improve user experience in your product. extremely cheap, they really seem bought for a song. WIsh posses the same delivery system that Ebay has, which puts all the heavy shipping organization and issues on the shoulders of sellers and shopkeepers. They need to (somehow) have the goods delivered within the period of 10 to 20 days, as this is the promise you can read on Wish policies page. If you are looking to create a similar to Wish app, delivery is another thing to improve here. The vast majority of all negative App Store and GooglePlay reviews Wish has received is due to the lengthy delivery, that takes more than sellers initially promise. Furthermore, website users also complain client support is insufficient - they remind themselves of Hachiko, waiting for the response long days. How Much Would an App Like Wish Cost? We took the responsibility of estimating roughly an iOS clone for a Wish-like app. The whole scope of features for the cost to develop app like Wish could be divided into a few blocks we’ll provide for you below. Sign up and welcome block, where users register, login via Facebook or G+, password reset option and static pages (like FAQ, Terms and Conditions etc.) - up from 58 hours. User Profile, that would include user’s public profile, with the list of followed and followers, and a photo editing option - up from 75 hours. More List, with options to integrate and set push-notifications, prizes, referral system, settings and where users could see what’s in there more list - 103+h. Cart feature, with users adding or removing goods to their carts, setting up delivery and payments. Here we also integrate the payment service provider, and it all takes around 60+ hours. Search for item, with recent and saved search results - from 36 h.
Product Details, That allows users add and delete photos of a selected item, see rating bar and watch/add reviews for items, and view details and rating of a seller. This all could approximately be developed in 65+ hours. Browse Feature, where users can look up the goods Wish recommends them based on their preferences, and also the Deal Dash feature for additional discounts; it all should take around 65+ h.
Overall, the only iOS client part of a Wish like app would start at 400+ hours. Apart from the client part programming, there are a few more parts to be developed in every project, even if you want to ,make an ecommerce app like FlipKart. The essential stages we conduct in Mind Studios are project specification, UI & UX design, client & backend development, and, before project goes live, testing is an essential round as well. The factual cost of an app like Wish could vary - different companies have different rates, but generalizing it all, the initial MVP cost would start at $ 30k. If you are interested in Android Wish/ Snapdeal app clone development - contact us for a detailed pricing. Wish app has a great lesson to teach us all - though it is great when shopping is fun, it is also great when shopping is of high quality, with fast delivery and responsible customer support. These things can still be improved in the online retail field, so if you consider entering this market, this are the areas to work on. Written by Yuriy Smirnov and Elina Bessarabova.